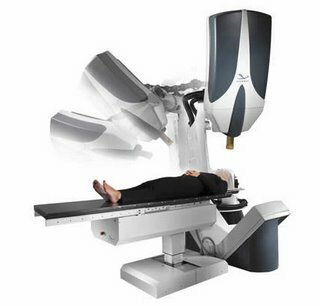 Accuray, the makers of the robot radiosurgery machine CyberKnife have applied with the SEC for a stock offering. The Sunnyvale, California company was founded in 1990 to sell the first Cyberknife systems for limited use radiosurgery in treating tumors in the head and neck. Since then, the robot system has advanced and successfully used for many different radiosurgery procedures. Over 140 of the multi-million dollar machines have been installed worldwide. Accuray will try to raise US $230 million in the offering.